Europe's first and only ECE R90 approved pad. 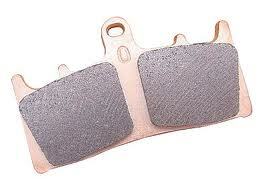 EBC Double-H pads offer the highest friction for street legal brake pads you can buy. These pads benefit from the highest friction HH rating for maximum stopping power and are made from sintered copper alloy like original pads for longer life and perfect braking under all riding conditions, wet, dry, hot or cold. When required, unique stainless steel radiator plates are fitted to reduce heat transfer into the bikes' hydraulics. The unique double segment vented design keeps the pads cooler and prevents pad drag and overheat or fade. When EBC broke into the sintered pad market, we really did our homework. We took all the current market offerings, tested them, analyzed them and exceeded them. We removed the iron powders commonly used in many sintered pads that cause the pad to "weld" to the disc under corrosion when the bike is parked and replaced it with stainless powder. We took out several other particles which our competitors still use which caused massive disc damage and created our launch material. After five years and millions of sets sold we upgraded the formulation again to our SB101C material which completely eliminated BRAKE NOISE, improved the pads HEAT CYCLING CAPABILITY, and improved feel. What we have today for the faster rider is the pinnacle of sintered copper alloy engineering, researched and tested in our own laboratories by engineers with over 50 years experience in sintered pad technology. NOW ECE R90 APPROVED. What does ECE R90 mean? Cheap and nasty motorcycle brakes are the quickest way to an accident no matter where or how you ride. EBC Brakes welcomes the new legislation on ECE R90 brake safety testing that shuts the door on unworthy parts. Until recently all EBC Brakes were tested by the notorious German TUV test centers and carried the KBA (German Motor Vehicle Organization) certification number. EBC Brakes is pleased to announce that after extensive multi-model testing at the MIRA (Motor Industries Research Association) test track located at Nuneaton, UK, that both EBC Kevlar® organic pads and EBC Double-H sintered pads have been approved.